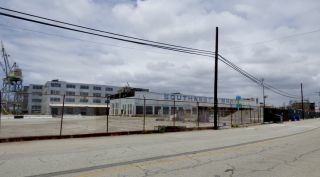 The Los Angeles City Council approved a lease agreement in May for this vacant property at the Port of Los Angeles, where SpaceX planned to build a factory for its next-generation launch system. SpaceX said Jan. 16 that work will take place initially in South Texas instead. In a statement, SpaceX said it was now planning to build prototypes of its Starship vehicle, the upper stage of its next-generation reusable launch system, at its site in South Texas originally designed to serve as a launch site. An initial prototype version of that vehicle has been taking shape in recent weeks at the site in advance of "hopper" tests that could begin in the next one to two months. "While I feel crushed about #SpaceX pulling the #SuperHeavy out of the @PortofLA, I feel confident that other innovators will see the huge value they get in San Pedro," he wrote. Super Heavy is the name SpaceX recently gave to the lower stage of the overall launch system that previously had the formal name of Big Falcon Rocket, or BFR. The upper stage was renamed Starship. In May, the council approved unanimously an agreement between the port and SpaceX to lease vacant property at the port where SpaceX planned to construct a factory for what was then still called the BFR. SpaceX sought to build the vehicle at the port, rather than its existing factory in nearby Hawthorne, California, because the vehicle's large diameter — nine meters — required that it be transported by ship rather than by truck. "This is game-changing for our city," Buscaino said at a May 8 council meeting where the agreement was briefly discussed. "We're going to start building spaceships at this terminal." SpaceX agreed to pay $1.38 million in rent for the first year, growing over the 20-year agreement to total $40 million. The company initially planned to build an 80,000-square-foot factory there, with later facilities covering 200,000 square feet. SpaceX expected to ultimately employ 700 people there. "It will be conducting production and development on the largest rocketship ever known, the Big Falcon Rocket," he said at the hearing. "Colleagues, with your approval, for our city, this will be a Big Falcon Deal." The council approved the lease agreement without additional debate. In its statement, SpaceX did not explain why it was moving work on the system to South Texas, but said it did not affect existing activities. "This decision does not impact our current manufacture, design, and launch operations in Hawthorne and Vandenberg Air Force Base in California," Behrend said. "Additionally, SpaceX will continue recovery operations of our reusable Falcon rockets and Dragon spacecraft at the Port of Los Angeles." SpaceX currently uses the port for droneships that serve as landing pads for Falcon 9 first stages, as well as ships that recover Dragon spacecraft that splash down in the Pacific Ocean. In recent days, the port has seen the arrival of both a droneship carrying the Falcon 9 first stage from the Jan. 11 launch of 10 Iridium Next satellites, as well as a ship that retrieved a Dragon spacecraft that departed the International Space Station and splashed down late Jan. 13 off the Baja California coast. In tweets later Jan. 16, Elon Musk, the founder and chief executive of SpaceX, said that development of the vehicle itself, including the Raptor engines that power it, would continue in Hawthorne, while at least the prototype versions of Starship are built in Texas. "We are building the Starship prototypes locally at our launch site in Texas, as their size makes them very difficult to transport," he said. The announcement comes less than a week after the Jan. 11 announcement that SpaceX was laying off approximately 10 percent of its workforce so that it can focus its resources on both its next-generation launch system as well as Starlink, its broadband constellation. SpaceX didn't go into details at the time about the size of the layoffs, beyond estimates form company sources that about 10 percent of the more than 6,000 SpaceX employees were losing their jobs. However, in a Jan. 11 filing with California's Employment Development Department, provided to SpaceNews after a public records request, the company revealed that it was laying off 577 people at its Hawthorne facility alone, a figure first reported by Bloomberg. The filing, required by the federal Worker Adjustment and Retraining Notification (WARN) Act, stated that all employees would be paid wages and benefits through their formal date of termination, March 12. The seven-page document listed the positions being eliminated, which included a wide range of engineers, technicians, machinists and managers. That figure does not include any layoffs at other SpaceX facilities, including in Texas and Florida, the two other states where the company has a significant presence. No WARN notifications from SpaceX regarding any layoffs have yet been published by the Florida Department of Economic Opportunity or the Texas Workforce Commission. Musk has yet to publicly comment about the layoffs, but he has in recent days showed off images of the Starship test article under construction in Texas, including one Jan. 10 where he said the vehicle had "finished assembly." That vehicle will make its first short "hop" flight soon, he said Jan. 5. "Aiming for 4 weeks, which probably means 8 weeks, due to unforeseen issues."